In this tense and moody psychological thriller, a timid British sound engineer begins to lose his grip on reality when he is hired to work for a flamboyant Italian horror director. When watching a film we tend to focus on the images, but without the incredible work of sound engineers and foley artists, the immersive experience of cinema could not exist. Equal parts paranoid thriller and loving tribute to the disappearing alchemy of analog sound recording, Peter Strickland's second feature Berberian Sound Studio is set behind the scenes of 1970s Italian horror cinema — the era of the notorious giallo, a genre that, while often snubbed by critics and scholars, offered fertile ground for visual and musical stylists, occupying an area between experimental and exploitation cinema. 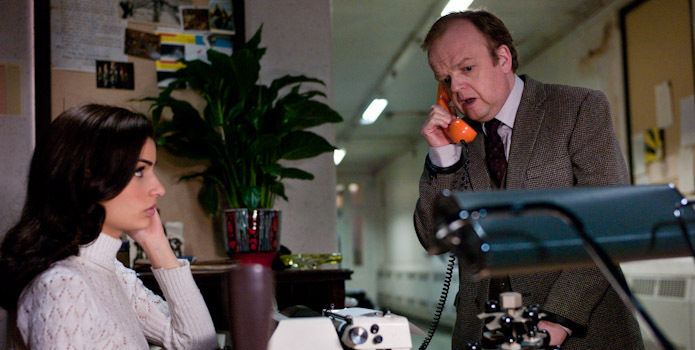 Gilderoy (Toby Jones) is a meek but gifted British sound engineer summoned to Italy by enigmatic horror-film auteur Gianfranco Santini (Antonio Mancino), where his genteel disposition immediately clashes with those of his alternately boisterous, genial and hostile Italian hosts. Accustomed to working on nature documentaries, Gilderoy is horrified to discover the truth about Santini's film, The Equestrian Vortex, a lurid tale of witchcraft which follows a group of supernaturally tormented students at a riding school (à la Dario Argento's Suspiria). We never see footage from the film, but as the soundtrack is recorded it is clear that its hysterics and violence are too much for Gilderoy's delicate sensibilities. As Gilderoy becomes unhealthily submerged in his work, the simulated aural violence starts to take on a cruel edge. Engineers snapping radish stalks or pouring oil into a scalding pan induce cringes with the mere suggestion of what the sounds are intended to evoke. As tension in the claustrophobic studio mounts, it becomes clear that Santini's film is corrupting Gilderoy's fragile psyche. 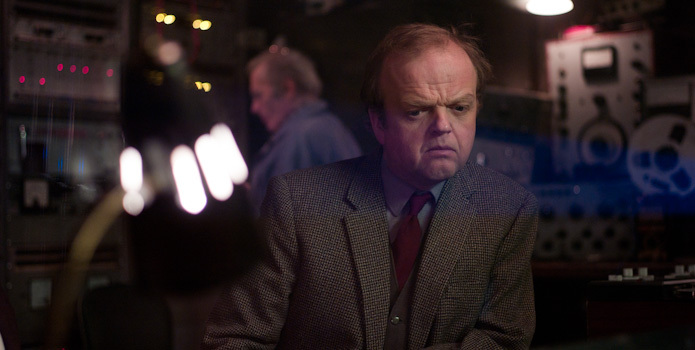 With Berberian Sound Studio, Strickland has crafted a Kafkaesque, meta-horror tale set in the lost annals of cinematic history. From the first scenes, the nostalgic pop and crackle of magnetic tape plunges the audience into a tense, richly ambiguous and evocative world of goosebumps-inducing sound. Jones gives a nuanced performance as the film's increasingly tormented protagonist. 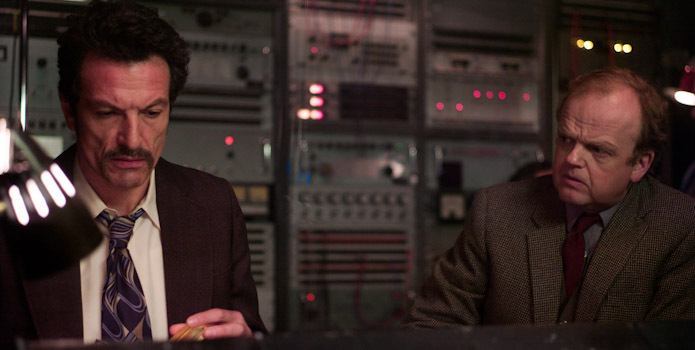 As Gilderoy strains under the psychological demands of his job, the film becomes brilliantly deranged, plunging us into the blurry meeting point between waking life and nightmares. Peter Strickland was born in Berkshire, England. 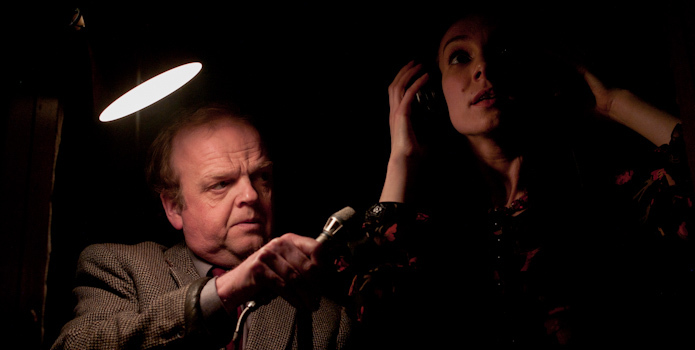 He has written and directed the features Katalin Varga (09) and Berberian Sound Studio (12). Copyright © Toronto International Film Festival Inc. 2012. All rights reserved.